A Sarita is a wax resist textile used by the Toraja Karataun people of Batuisi and Saluleke in the western mountain range of Toraja, Sulawesi-Indonesia as a ceremonial decoration. But not many people knows whether Toraja also has a batik, unfortunately this original batik made by the hands of indigenous people of Toraja have become extint. According from local legend, the Sarita was brought by Torajan ancectors who first came to earth from upper world or heaven. 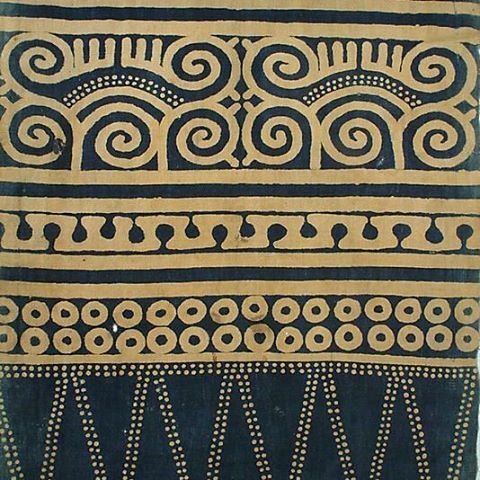 This textile has a sacred unique decorative and its used to avert evil. The black color comes from mud dyes. The ornament of this cloth depicts the tale of the ancestral hero Kapunan Poki, who is symbolized here as a crocodile and whose shortened tail symbolizes injuries sustained fighting many battles for his people. In mythology, he was last seen at Minanang where two rivers join and it is only the people of this area that are allowed to tell this story. The story was first recorded on cloth when a child sleeping in the forest with his parents urinated on a white blanket. When the blanket dried in the morning the motifs emerged.